Lewis Webb (blue shirt) in action for Peterborough Sports against Sleaford. Photo: Rowland Hobson. Ten-man Peterborough Sports suffered extra-time agony as they fell at the first FA Vase hurdle yesterday (September 5). The city team went down 3-2 to higher-level Sleaford after seeing defender Ollie Medwynter dismissed on the half-hour. 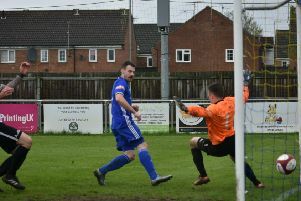 Medwynter received his marching orders for conceding the penalty that allowed Sleaford to hit the front and they doubled their advantage eight minutes into the second half. But Sports made light of their numerical disadvantage to claw their way level thanks to a brace of Jordan MacLeod goals. But their battling fightback was ended four minutes into extra-time when Sleaford hit the crucial goal. Ian Edge resigned as Huntingdon manager in the wake of their Vase exit at lower-level Downham Town. Jake Shepherd hit a late consolation as Town were beaten 4-1 in the final game of a miserable reign for Edge which began in January and produced only one win. There was a local success in the opening round as Sam Strange’s last-gasp winner fired Blackstones to a notable win. The Stamford side dumped out higher-level hosts Thetford 3-2. Jones De Sousa and Addie Staffieri had hit levellers before Strange struck in stoppage time.